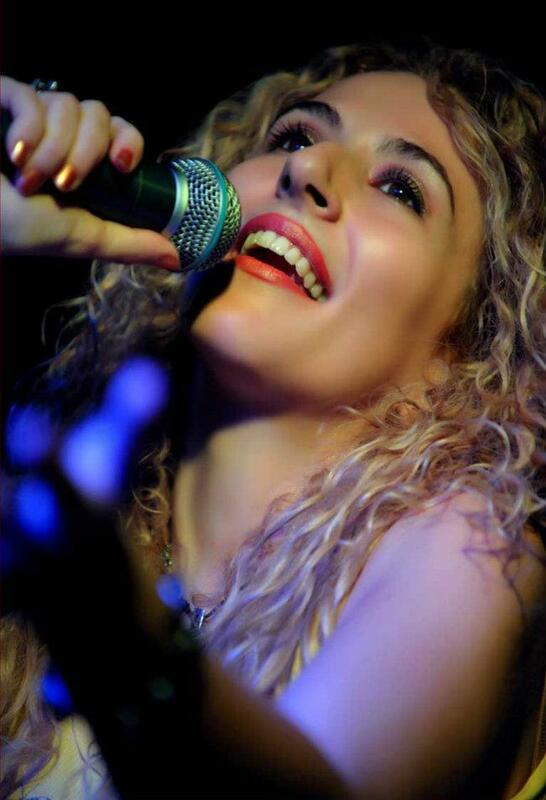 Antigoni Katsouri is a very talented singer, performer and composer, who first introduced herself to us a few years ago, through her debut cd, "OURANIO TOKSO" (=RAINBOW), an excellent album which received best reviews from the media. Later she participated with D. Mentzelos (Imiskoubria) at his new cd, "O raper tis hronias" (=the raper of the year), with the hip-hop song "A RE PATERA" (=oh father) and the relevant videoclip (June 2011) – a moving song about the deep value of fatherhood, which expresses the songwriter’s true life story. Recently she released her second personal album, titled “ENA HAMOGELO GIA TO AVRIO” (=A smile for tomorrow) together with the videoclip for the song “Apocalypse” which is included in this album. This cd, just like the previous one, offers a tone of optimism and happiness and a warm, true smile for tomorrow and for the present ! It contains 14 songs, written by famous composers and lyricists, as well as a traditional song from Smyrne, subversively adapted (“Tha spaso koupes” – song and remix). Antigoni’s discography includes songs, which combine elements from various musical styles (ethnic, new age, world fusion, ambient, alternative, jazz) and they are soulfully interpreted by Antigoni’s dreamy, magical voice and primped by a really big variety of real instruments (piano, synth, clarinet, kaval, trombone, trumpet, saxophone, lyra cello, violin, viola, accordion, bandoneón, vibraphone, oud, lute, kanun, mandolin, classical guitar, acoustic guitar, electric guitar, electric bass, contrabass, drums, cajon and percussion) performed by very top musicians who follow the fine arrangements. Her albums’s production is remarkable in many aspects, with a rich and elegant material (wonderful songs, beautiful cover, booklet with many colourful pages full of images and graphics), which Antigoni as always diligently took care of personally. As it concerns her life and her musical studies, Antigoni comes from Greece and has an origin from Cyprus. She has also lived as a child in USA (Washington D.C) and Germany (Tubingen) for some years, while she is continuously up to now travelling to various countries in Europe and abroad. Since eight years old she started composing and singing her first songs and at the age of ten years old she was presented as a "MIRACLE - CHILD" in the national T.V. and radio programs in Greece. She has performed in many concerts and gigs since a young age, in a wide repertoire, greek and international. She has also been cooperating with other greek artists, like Marios Tokas, Vasilis Papakonstantinou, Lakis Papadopoulos etc. While performing, she combines her flexible voice with the various instruments that she plays (synth, accordion, bouzouki, fife) and mainly with the piano – she has been granted the DIPLOMA OF PIANO, with the EXCELLENT GRADE, as well as the DIPLOMA OF LICENTIATESHIP IN PIANOFORTE from the Thames Valley University, London College of Music [title L.L.C.M.] . Her repertoire includes songs from her personal discography and also special adaptations of other greek and international songs. Her fresh, magical voice, combined with the virtuosic abilities of the distinguished musicians who accompany her at her gigs, makes possible for her to choose, depending on the occasion, through an astonishing big range of repertoire. Apart from vocal and musical studies, she has studied LAW at the University of Athens and she works today as a musician and as a notary/solicitor. She also loves painting - drawing (FIRST PRIZE in the 37th European Contest of Painting) and she specializes in Byzantine icon making.